A handshake can be a powerful thing. The tradition is very old and European in origin, though it has spread across the world in modern times as a standard form of greeting. Recent news stories have highlighted the importance of the handshake in American presidential meetings – President Trump is said to have a deliberately firm, aggressive handshake. So while we’re talking about shaking hands, let’s look at some handshakes, points, touches and other gestures that made a statement in Australian history. Douglas MacArthur was the American general in charge of combat operations in the Pacific during World War II. After the Philippines fell to Japanese invasion in 1942, MacArthur transferred his command base to Australia. He and Prime Minister John Curtin had a strong rapport, and shared goals for the defence of the Australian mainland. 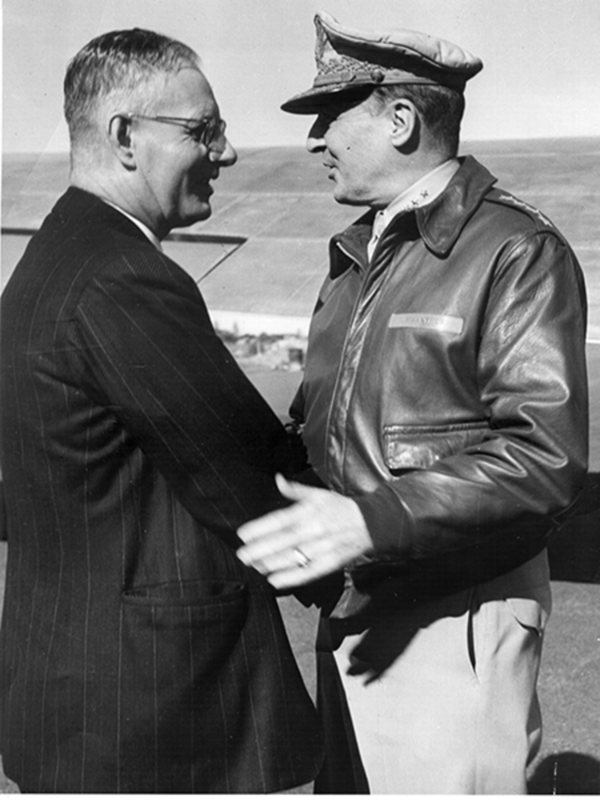 With thousands of American servicemen posted in Australia during MacArthur’s stay, it saw the beginning of the long alliance between the two countries and influenced Australian society in countless ways. Royal protocol is strict. Bow or curtsey, conservative dress, call her ‘Ma’am’ and never, ever touch. When Prime Minister Paul Keating laid a gentle hand on the Queen’s back in 1992, the British press had a field day. ‘The Lizard of Oz!’ one headline screamed, with royalists up in arms about the ‘disrespect’ the PM had shown. Keating was merely trying to direct the Queen towards Dame Pattie Menzies, but some suspected a deliberate motive. Keating’s republicanism came to the forefront during the Queen’s visit, and many suspected his casual disregard for the protocol was designed to draw attention to what he saw as the anachronism of the monarchy. 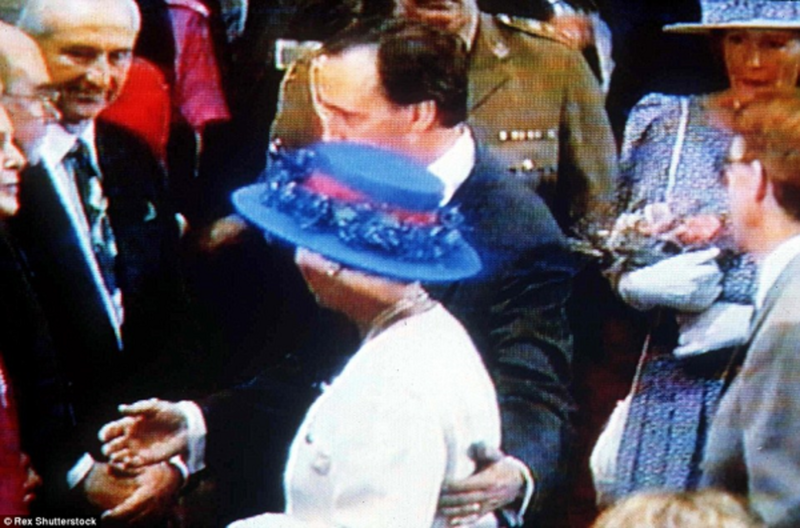 Keating’s hand on the Queen’s back, seen here on a TV screen, made headlines around the world. It wouldn’t be the last time Keating’s attitude to the monarchy would irk the British press. Rex Shutterstock. The value of a firm handshake is well documented, but sometimes, it can go too far. In 2004, one day before the federal election, Mark Latham, then Leader of the Opposition, arrived at an ABC studio in Sydney. He crossed paths with Howard and shook his hand in a very domineering, aggressive way. Latham claimed it was normal, perhaps a little firm, and ‘revenge’ for Howard apparently squeezing Latham’s wife’s hand too hard at a press function. Howard, in the years since, has suggested it was very deliberate, a way of physically dominating the shorter man. The handshake is sometimes said to have cost Latham the election, a charge he has vehemently denied in the years since. 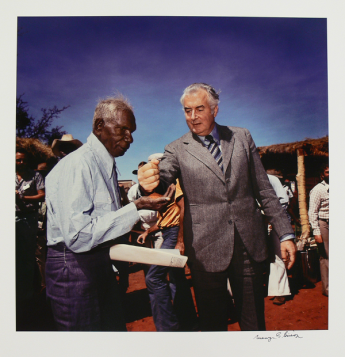 With those words, Prime Minister Gough Whitlam poured a handful of earth into the hands of Vincent Lingiari, and marked the next stage in a long campaign for Indigenous land rights. Lingiari had been a leader of the Wave Hill walk-off in 1966, when Aboriginal pastoral workers walked off the job at the Wave Hill cattle station. A protest about wages turned into a nine-year campaign for justice and land. In August 1975, Whitlam’s gesture transferred the leasehold on the traditional lands to the Gurindji people, but the struggle for land rights has continued across Australia. This photo of Gough Whitlam pouring earth through Vincent Lingiari’s hand has become an iconic image. It was taken by Mervyn Bishop on 16 August 1975. Museum of Australian Democracy Collection. Australian athlete Peter Norman made a political statement in 1968, when he stood next to John Carlos and Tommie Smith on the podium at the Mexico City Olympics. Smith, who won the 200m sprint and Carlos, who came third, told Norman they planned to make a silent protest in support of civil rights for African-Americans while on the podium. Norman wore an Olympic Project for Human Rights badge and stood silently in solidarity as the two black athletes made their protest. While categorised at the time as a ‘Black Power’ salute, it was, according to Smith, a ‘human rights salute’. Many believe Norman was punished for supporting the protest. The International Olympic Committee banned Smith and Carlos for life for political protest, prohibited under Olympic rules. Norman was not banned, but was not selected to represent Australia in 1972, despite qualifying repeatedly. 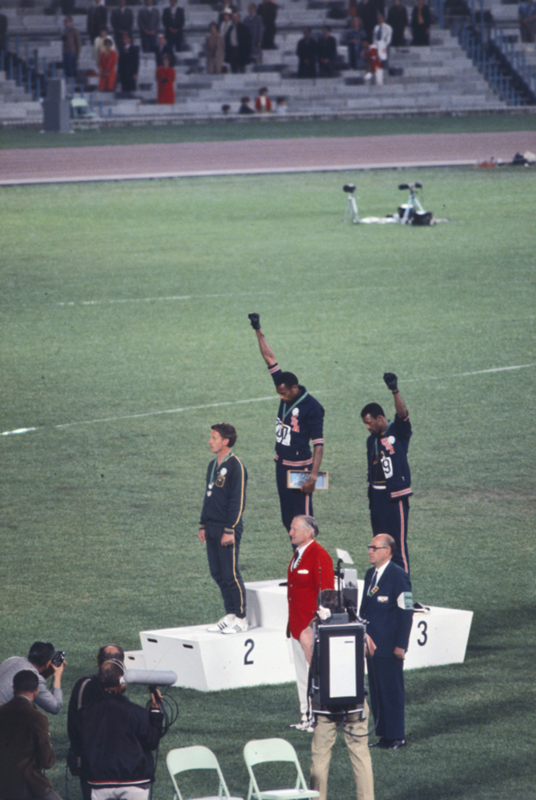 This famous photo shows Peter Norman standing silently as his two American friends give a salute for civil rights. Norman, a devout Christian, believed it was his duty to support his colleagues in their struggle. Getty Images. Decades after Peter Norman took a stand, Australian Rules footballer Nicky Winmar made his own protest gesture against racism. During a game in 1993 between his team, St Kilda, and rivals Collingwood, the Indigenous player was racially abused by Collingwood supporters. After the game (which St Kilda won), Winmar proudly lifted up his guernsey and pointed to his skin. The photograph of the incident has become an iconic one in Australian sport, a powerful statement in support of racial equality and his pride in his Aboriginal heritage. So powerful was his statement against racism, and so recognisable the photo, that in 2017 a campaign began to honour Nicky Winmar with a statue re-enacting his gesture to the crowd. Fairfax Media. Over a decade later, another Indigenous player’s expression of pride in his heritage sparked fierce national debate. Sydney Swan Adam Goodes, having heard a racial slur from a member of the crowd and pointed her out. 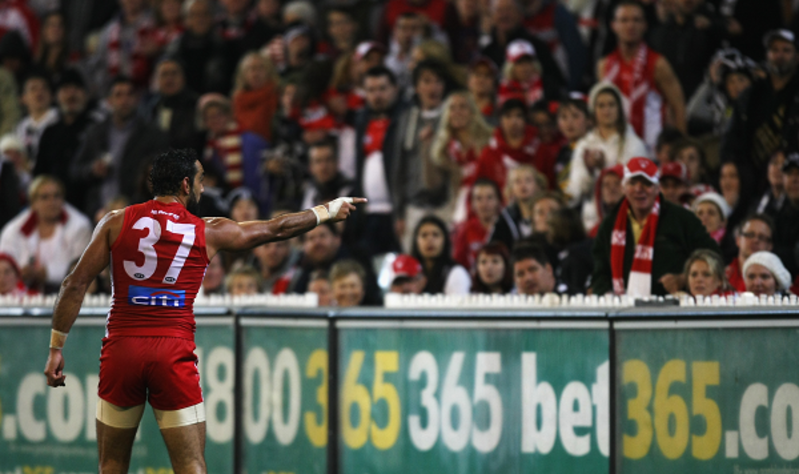 Many fans did not take kindly to the incident, believing it to be heavy-handed and petty, and Goodes was booed by the crowd during many of his subsequent games. Unrepentant, Goodes famously performed an Indigenous war dance after scoring a goal in 2015, his hand miming a spear being thrown towards the Carlton cheer squad. Goodes made the gesture to celebrate his Indigenous roots, and many compared it to Winmar’s famous stand 22 years before. Detractors said it was aggressive and inflammatory. Goodes' supporters maintain criticism of his actions, and the booing, was entirely motivated by racism. By making both his gestures Goodes demonstrated the power of a single movement in raising awareness and making a political point – his point being about his pride in his identity, and against racism and intolerance. 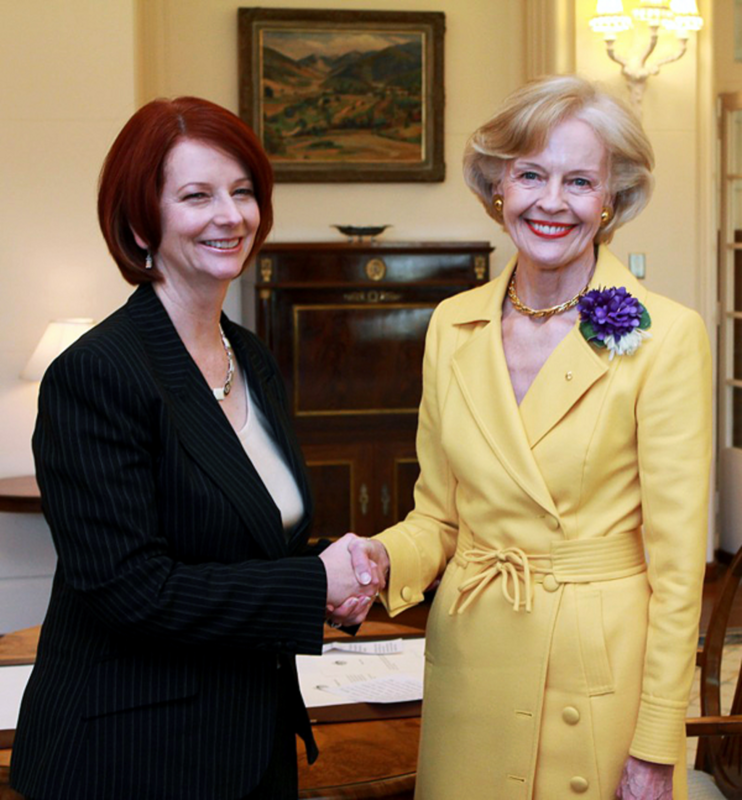 The handshake between Julia Gillard and Quentin Bryce was between Australia’s first woman Governor-General and its first woman Prime Minister. Knowing the importance of the moment, Bryce chose to wear a corsage on her jacket in the suffrage colours of white, green and purple. The corsage had belonged to her grandmother, herself a passionate supporter of women’s rights and education. The bright yellow coat and suffrage corsage worn by Dame Quentin Bryce in this photo were donated to the Museum of Australian Democracy in 2010, a recognition of their significance. Fairfax Media. Three years later, Gillard’s hand was not shaking in friendship but in anger, as she pointed across the chamber to her opposite number, Tony Abbott. In response to allegations she was supporting alleged misogynistic behaviour by the Speaker, Gillard let fly with a tirade against Abbott that became a viral sensation. The image of Gillard in full-flight during her speech has become as important a part of her political story as the image of herself with Quentin Bryce at the start of her term.